Twitter is one of the most popular social networking site out there. About 500,000 people sign up on it everyday. People usually have a lot of followers and also follow a lot of people themselves. This simply means a lot of noise, which can be quite annoying. The good news is that a lot of good tools are present out there that will help you cut through the noise and get to the most useful things. Most of the time we have to spend a lot of time scrolling down our timeline before we find the Tweets that actually interests us. If you are tired of spending your time like this, then try using StrawberryApp which simply takes in all the Tweets from your followers and sorts them out by most mentioned. This instantly tells you what news is being discussed the most. Best thing: Instead of checking a site everyday, you can simply get your top news as updates directly to your inbox through email. One thing that you should always remember is that you should never flood your followers timeline. For this, Buffer will help you a lot. 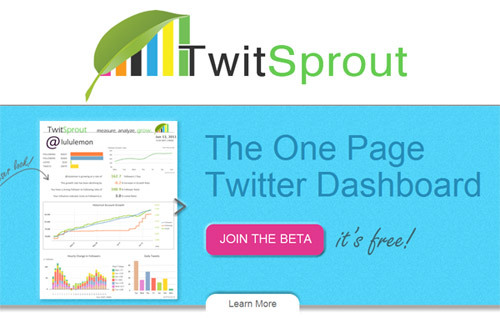 You can put your Tweets into the Buffer and then this tool spreads them out through the entire day. Bu using browser extensions (Chrome, Safari or Firefox) you have the ability of adding Tweets to it from anywhere on the web. 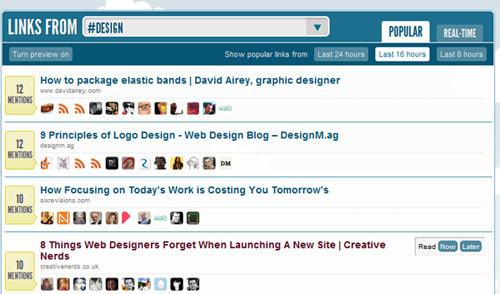 This allows you to be a good source of information to your followers. Best thing: For every Tweet that gets Buffered, you will be provided with detailed stats on clicks, retweets and reach to let you know more about what your followers like. Why Tweet when no one is listening? Well now you can know the best publishing times for your Tweets using Tweriod. It provides very simple two graphs that tells you when your followers are most likely to see tweets. It tells you both, the best time of the day and best day of the week to publish your Tweets. You can even get this report as a pdf file. Best thing: It not only provides graphs for when your followers are online the most, but it also provides a graph on when your most mentions happen so that you can adjust your tweeting further. Want some inspiration for blogposts? If so, then use TweetWally. This tool lets you gather Tweets from your followers and turn them into a TweetWall, that displays this content awesomely. This tool also allows you to know that who is interacting with you the most by searching for your username. Best thing: It allows you to continually edit and customize the tweets. Sometimes you and your friends want to talk about something private, what do you do then? 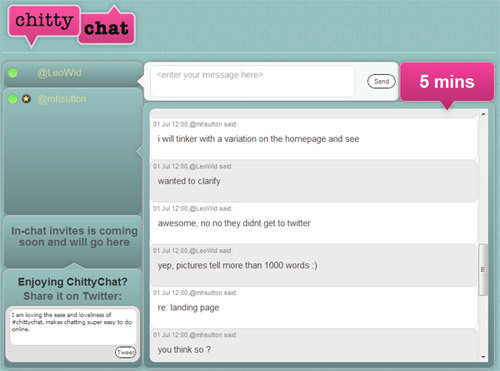 You use ChittyChat. Simple. It is a small but helpful app that lets you take your conversations you are having with your friends on Twitter into a private chatroom. All you are required to do is to send out a Tweet to your friends whom you want in the chatroom and just include the username @chitty_chat. Everyone would instantly get a link to that private chatroom and them you can talk about whatever you want! Best thing: You are not required to sign up for anything. All you have to do is to send out a tweet and that’s it. Sometimes the people you follow can be really annoying. So here is where Tweepi comes to help. With this amazing tool you can simply scan through your following and get rid of people that don’t add much value to your stream. It displays a list of people that are not following you back, or have turned inactive or those who are flooding your stream with a lot of tweets. Best thing: It also works the other way round, and shows you the people your aren’t following back, so you can easily reciprocate the following. This one is a Twitter analytics tool. It shows all the important metrics from your Twitter account. You can get to know the development of your follower count, and how many time you have been mentioned or retweeted over time. You see all the graphs in overlay, and this fact lets you compare if you are growing organically. Best thing: The design of the App is simply awesome. It shows you the results in a very neat manner on a single page and you can even use it as an infographic. Twitter is sometimes used by people for monitoring some specific keyword to see what is going on with a brand, competitor or topic of interest. Well Twilert lets you keep tabs on all of these things. All you have to do is to set up some of these terms and then you will daily get a digest email with all Tweets mentioning them. Best thing: The search terms of this tool are very customizable and you can even set the sentiment of certain tweets being mentioned to be displayed only. Want to know you is Tweeting about the article that you wrote? Now this is possible, thanks to BackTweets. It is an amazing tool that lets you know every username that has ever tweeted about the post, whose link you just dropped in. You are not required to sign up for anything, and you can start getting the results immediately. Best thing: BackTweets guarantees that you will find all mentions of the post from Twitter, making it better than Topsy, Twitter Search or TweetMeMe. All these tools will help you be more productive and active on Twitter. You should definitely use these tools but also keep in mind the social element of Twitter, and do not turn into an auto-bot. Which tool/app do you use the most for Twitter? Share it with us in commnets below. Great list of apps. Most of which I’ve never heard of like Buffer. Going to try Backtweets now.